I stopped for lunch. When I had taken my helmet off I restarted the engine...oh dear, a loud tappety racket! I therefore will be stripping the engine again to fully check all of the parts that SRM advised me to check when I spoke to them about their cam follower that went bad. 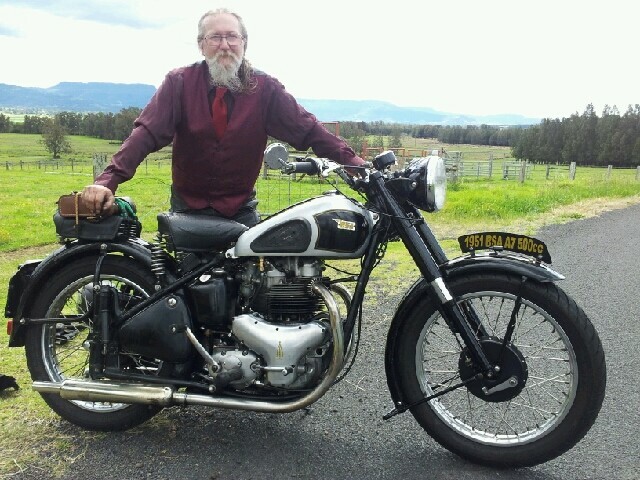 Another lovely ride home; this motorbike runs so sweetly! PS. Sitting in a warm cafe while wearing thermal underwear is not a good idea. I'm sending someone round to take all your tools. Buy a lotto ticket and with the winnings get SRM to build you a motor. I haven't needed a rubber for many years. After our third child was born I had the tubes sealed. Ha, still got none proven! Greybeard - if I recall correctly you only changed the failed follower. Bad move. If one of a set is duff there's no way I'd chance the others. Should have replaced the whole set with the known good set you have. As I recall the duff followers were from SRM - if so I wouldn't take Muskrat's advice and get them to build you a whole motor! I think I remember that your bike has a new ish oil pump?? Sealing the tubes not a problem. Sealing the wallet is now the issue. Wouldn't all these oil starvation possibilities show up first in a spun rod bearing? That's where I would think the most critical demand lies. Your correction, if I'm wrong, is quite welcome. When I get a minute I'll post SRM's reply after I contacted them about the worn follower. I will not post it in this thread though. and my opinion on how the crank survives a little longer! I'm pretty sure that modern four-stroke mowers just have a finger on the Conrod that flicks oil around. Lawnmowerman?